For some reason, bitdefender notified me about malware. Not sure why this is, bvckup2 is running fine. Thanks, we'll file the false positive report with them. If you have an option to do that from your end, please do so as well. Ok, I filled a ticket with bitdefender. The analysis of the file sample has been completed and due to the behavioral nature of the detection, a global exclusion for it will not be possible. Please do not hesitate to contact us should you have any other inquiries in the future. This is easily the worst response from an AV vendor I've seen to date. At the very least it implies that they have no full control over how their "behavioral detection" works, so they can't actually reign it in when it misbehaves. Sorry to hear that. I did not get a reaction from them yet. I would like to use bvckup2, so I guess I should create an 'exception' in bitdefender for bvckup2 exe files. 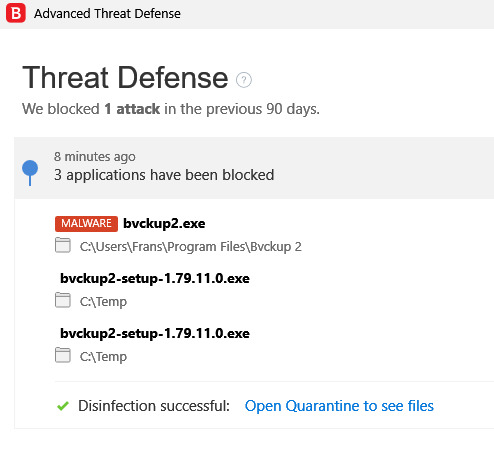 False positives happen, but it's the first time I see a Bitdefender one. Their handling of it is rather strange, because nearly all antivirus vendors try and address any false positives as quickly as possible. Perhaps they already patched up, but just didn't bother to follow up with... I can't tell, it's really between you and them. If in doubt, you can always run any program file against 50+ antiviruses at once over at https://virustotal.com, which is one of Google's properties now. Just to follow up on this topic: the newer versions of bitdefender no longer bvckup2.exe as malware. So I guess they solved the issue. OK, excellent. Thanks for the follow-up.